Since its first season, The 100 has been a show about making the tough decisions in order to survive - with Clarke Griffin, the daughter of a doctor and a man executed for treason, the unlikely leader on whose shoulders many of these decisions have fallen. However, in the wake of the events of the season 2 finale, which saw Clarke make the decision to kill the entire colony of Mount Weather in order to save her own people (even though some of those inhabitants were allies), Clarke ran from her friends and family, and fled the grounders who sought the power of Wanheda. Now, in the season 3 finale, 'Perverse Instantiation - Part Two', written by showrunner Jason Rothenberg and directed by Dean White, Clarke is faced with another momentous decision. As with many of the other choices placed in front of the young leader, the fate of the world rests on her shoulders. In 'Perverse Instantiation' Clarke must decide whether to kill ALIE once and for all, or doom the Earth's population by destroying the City of Light. As with all of Clarke's previous decisions, she chooses the path that she believes to be right, which usually isn't the easier path to walk. However, the moment of the choice loses a bit of tension due to the portrayal of ALIE as an ultimate evil who takes away humanity's free will. Bellamy may have tried to tell Clarke in season 1 that "who we are and who we need to be to survive are two very different things," but Clarke still believes that those are one in the same - and people should be the ones making the tough decisions, not an AI. The moment Clarke pulls the kill switch on ALIE was inevitable since season 1, which demonstrate's The 100's excellent character development but takes the wind out of the sails of ALIE as the main antagonist of season 3. Still, the lead up to Clarke's final choice to kill ALIE, as with her decisions in the past, was not a simple mission. In order to get to the kill switch, Clarke decides to undergo a blood transfusion with the last known Nightblood, the brain-dead Ontari, and take the Flame into her own head. But, as the Flame instructs Clarke, she must take an ALIE chip and go into the City of Light, where she's reunited with former Grounder Commander Lexa. The reunion of Clarke and Lexa is emotional - and made more emotional by the fallout of Lexa's death, both on The 100 and among fans - with the former Commander jumping to Clarke's aid against a group of ALIE's followers. The too-short return of Lexa while satisfying in its opportunity to give Clarke some closure about her love's death, highlights the excellent dynamic and relationship The 100 loses with Lexa gone. Apart from Clarke's reunion with Lexa, her time in the City of Light is largely more of the same struggle against those who are under the control of ALIE. 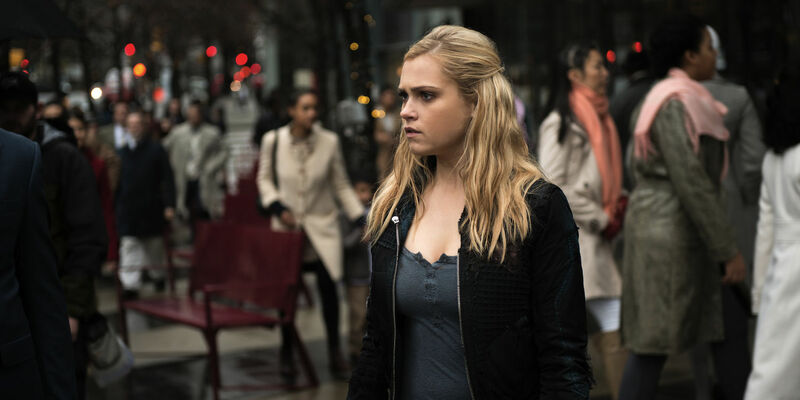 This time, Jasper takes on the role of working to thwart Clarke, though it is the circumstances surrounding Clarke's body, rather than her mind, that stand a chance of preventing her from completing her mission. Outside the City of Light, Clarke is being tenuously kept alive by Ontari's blood, which becomes difficult when the Grounder crashes, forcing Abby to open up her chest and Murphy to manually pump her heart in order to keep the blood flowing and prevent the Flame from liquifying Clarke's brain. However, though they are sequestered in the Grounder throne room, ALIE's army has climbed the tower in an effort to prevent Clarke from completing her mission, with Bellamy leading the group of resistance. But, there is tension among Bellamy's team, which consists of Octavia, Pike, Miller, and Bryan. With Bryan injured and Miller worried about his health, Octavia is left alone with Pike (who executed Lincoln earlier in the season). Octavia's need for revenge gets the better of her, allowing ALIE's army in to the tower and forcing Bellamy and everyone to retreat. Octavia's need for vengeance parallels that of her brother from earlier in the season, which drove him to side with Pike against the Grounders. Though that particular aspect of Bellamy's story arc was poorly realized, his need to save his sister from the same mistakes he made manages to capitalize on his need for revenge and the core of his character throughout the entirety of The 100: protecting his sister. However, though Pike saves Octavia in their last stand against ALIE's army, once the fighting ceases and ALIE has been defeated, Octavia kills Pike. The moment is fantastically acted by Marie Avgeropoulos, who portrays the coldness of Octavia's actions and the final step to the darkness that Bellamy has been attempting to save her from. Additionally, Bob Morley plays the scene well, as Octavia turns her back on him both literally and metaphorically. While those released from ALIE are reuniting with their loved ones, the Blake siblings are falling further apart. Now, it remains to be seen if Bellamy and Octavia will be able to repair themselves and their relationship in season 4. All in all, the finale of The 100 manages to tie up many of the story and character arcs of season 3 in a satisfactory manner. Though many of the routes the show took to get to the war of Clarke and her people against ALIE and the AI's followers were poorly realized and rushed - such as Pike's turn as leader of Arkadia and Lexa's death - The 100 delivered a compelling conclusion with an exciting mission in the City of Light and fight in the commander's chambers in Polis. Looking ahead to season 4, it seems the human race will again be forced to fight for survival if ALIE's predictions of Earth's inhabitants having less than six months before the planet is nearly completely unlivable turn out to be true. So, it remains to be seen if the Sky People and the Grounders can come together and if Clarke will find another way to survive. But, as with previous seasons of The 100, whatever comes next will force the characters to make the tough decisions in order to survive on Earth. The 100 season 4 will air midseason on The CW.